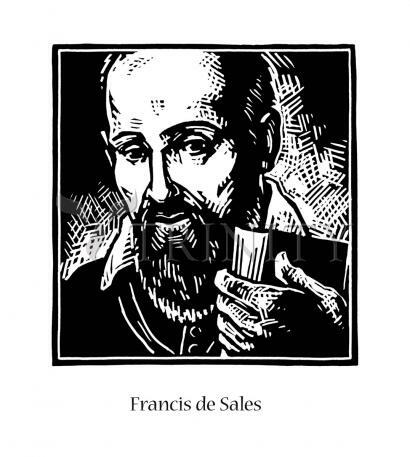 Saint Francis de Sales (1567-1622) was bishop of Geneva, Switzerland at the time of the Counter Reformation. Francis is renowned as a gifted preacher and writer who believed that holiness was possible for everyone and not just for monks and nuns, a radical idea at the time. He wrote his most famous book, Introduction to the Devout Life, for these ordinary people in 1608. In it, he counseled busy lay people to "retire at various times into the solitude of your own heart, even while outwardly engaged in discussions or transactions with others, and talk to God." What greater honor or grace, what more real and perfect happiness can we desire, than that of being loved by God? Yet our hearts allow themselves to be carried away by their caprices and go from creature to creature, just as if they were going from house to house, to see if they can find lodgings and discover real satisfaction. All in vain! God, Who has reserved the human heart for Himself, has forbidden all creatures to give our hearts genuine satisfaction and contentment, so that we are forced to return to Our Lord. And even if we return to Him more by force than by love, God does not refuse to restore us to His grace, to give us back the place we had previously enjoyed, and to caress us without inflicting any reproaches. Francis was born in the family castle just 21 years after the death of Martin Luther, and contributed enormously to the success of the Counter Reformation. The Council of Trent, which embodied the true principles of self-reformation of the Church, finished its final session just four years before Francis's entry on the earth. His life was contemporaneous with a galaxy of saints that mark any period of challenge to the Church: Pope Saint Pius V whose Dominican habit became the model for today's pontifical dress, SS. Charles Borromeo, Philip Neri, Teresa of Avila, John of the Cross, Francis Borgia, Stanislaus Kostka, Aloysius, John Berchmans, Vincent de Paul, Peter Baptist, Peter Canisius, Peter Claver, Peter Fourier, Jane Frances de Chantal, John Francis Regis, and Mary Magdalene de Pazzi. His time was similar to that of the great Apostolic Age, a second visible coming of the Holy Spirit. Of high lineage on both sides of the family, Saint Francis may have aspired to almost any position in the state. Francis was the eldest son of Francis, Seigneur de Nouvelles, and Frances of Sionas, (it's not a surprise then that he was named Francis!). Born prematurely (7th month), Francis was a sickly child. The day following his birth, he was baptized Francis Bonaventure. Because his health was so delicate, his mother and Abbé Déage taught him the virtuous life at home. Perhaps Francis was influenced in later life because of the room in which he was born --Saint Francis's room. Here there was a painting of Saint Francis of Assisi preaching to the birds and fish. Today's saint certainly imitated his patron's simplicity and gentleness.